Coso Peak lies within the boundary of the China Lake Naval Weapons Center, the highpoint of the Coso Range and a P2K. It had been a month since it had last snowed here in early December when I had first come to climb this summit. Too much unconsolidated snow with poor preparation (no gaiters or snowshoes) had proved the undoing of that first effort, but I was back at the start of the new year for another shot at it. The snow was less formidable, better consolidated, and would pose no problems for the day's effort. Having slept in the van about a mile from the base boundary, I was up before dawn and hiking in the early morning cold with temperatures near freezing. It was just light enough to hike without a headlamp when I started off before 6:30a, reaching the gated fenceline in about 20 minutes. I hopped the fence and continued down the road, in better condition on the base side than to the north. Clouds had moved in during the night to cover much of the sky, but the eastern horizon had clearer skies which made for a pretty sunrise with pink and orange coloring to the cloud layer just before sunrise, shortly after 7a. At a fork in the road I turned right to Crystal Spring where the road ends in half a mile. Some decent stonework was done to create a catch basin from the spring to allow cattle grazing in this desert landscape. The fencing for a corral is in ruins and there is little else remaining from wooden structures that once stood nearby. I headed cross-country to the southwest, aiming for a canyon I had identified on the map as a reasonable ascent route. I had planned to hike west up this canyon to approach Coso from the north, but at the mouth of the canyon where it forks I made a sudden change in plans. Though a duck here indicated I wasn't the first to consider hiking up the canyon, the ridgeline running up from the fork looked to be mostly snow-free and a reasonable route in its own right. I did not like the idea of hiking through snow in the shady canyon where at least some of it would be unconsolidated and preferred to keep my boots and feet as dry as possible. The slopes leading up the from the desert floor were only moderately vegetated, making for no bushwhacking and only minor weaving around obstacles. Portions of the ridgeline offered some rocky scrambling, a welcome respite from the more trudging aspects of the less-featured slopes. The steepest portion of the ridgeline route was in the very beginning, but the gradient remains difficult most of the way, climbing almost 2,000ft in less than a mile and a half. 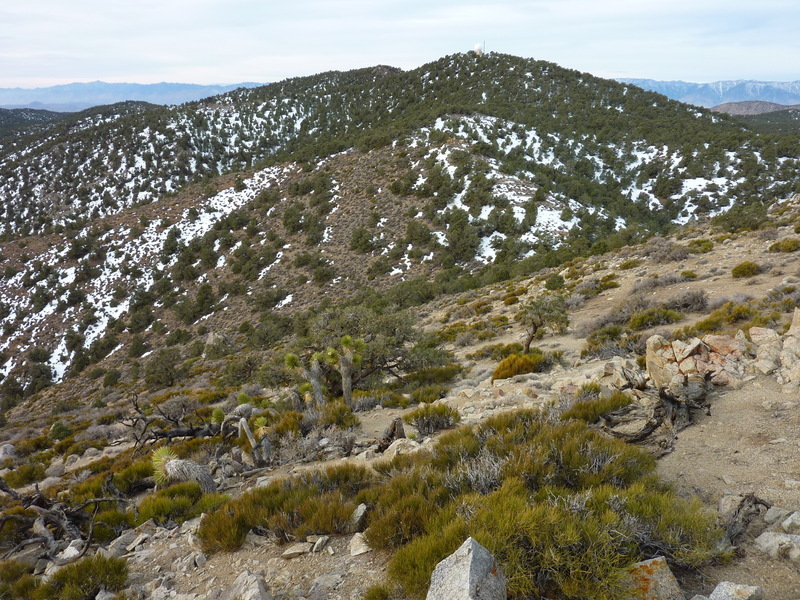 As one climbs higher, the desert scrub gives way to junipers and pines, and more snow can be found even on the ridge above about 7,500ft. I first spotted the summit from about a mile away, a large white ball easily marking the top. Two hours after starting out I was on the last stretch to the summit, now only 15 minutes away. I began to watch out more carefully for vehicles on the road or personnel about the summit. When I reached the road just below the summit the first things I noted were the tire tracks in the snow. Most likely contractors working at the communications facility, the place was not as unvisited as I might have liked. I had no idea how often people come up here, but clearly at least several times in the past few months and for all I knew, daily. I was happy to find no trucks parked outside the facility when I reached the top. A large white ball sits atop a small beige building with a large array of solar panels facing south. Evidently this facility was fairly new, as one peakbagger who I spoke with that had visited in the past few years had found only an empty pad at the time. The highpoint of Coso Peak is found in a rocky clump just south of the solar panels. I looked around but found no sign of a register in any of the obvious places. A more thorough search did not seem worthwhile - I imagine this is one of those peaks that most illegal visitors would not want to make public. I snapped a few photos looking west and east, and was soon on my way back - I had no interest in hanging out for the next service truck to arrive. Utilizing the same route for the descent, it took an hour to return to the desert floor at Crystal Spring and another hour to get back to the van. It was just 10:45a, having taken but half a day for the peak. The afternoon peak would be more challenging though far less recognizeable as a climbing objective. Wortley BM is a P1K on the Sierra Crest north of Ninemile Canyon. I spent the next two and a half hours driving out to the pavement at SR190, then back to US395 and south to Ninemile Canyon before taking that long road up towards Kennedy Meadows. I drove just past the road's highpoint at 7,600ft where it goes over a saddle between the Chimney Creek and South Fork of the Kern River drainages. Wortley BM is found at the end of the 4-mile zigzagging ridgeline that follows between these two drainages from the saddle to the Sierra Crest in a northeasterly direction. The area is part of the Sacatar Trail Wilderness, a region that sees few hikers but plenty of hunters in season. This was my first visit to this Wildernesss. I parked just off the pavement at the start of a dirt road that looked to head off in the direction I wanted to go, and started around 1:15p. The dirt road turned out to be short-lived, going only about a third of a mile to a turnaround and a primitive campsite used by hunters. Deer tracks were evident everywhere in the soft, bare soil that characterized the terrain in this modestly forested region. The deer had made ample trails throughout and I used these where I could as I followed the ridgeline in a meandering route from one bump to the next along the way. Most of the route was snow-free, but there were many sections in the shadier northern slopes that had held the snow from a month ago. Here I would take more time to look for a way around the snow, or travel over the more consolidated portions or where the deer had first made tracks. I could see my destination after climbing the first rise, but it took almost two more hours to finally reach it. I found obsidian shards in a number of locations, evidence of ample usage by the native Americans long before myself or the modern hunters had made use of the area. In one location I found dozens of chips, suggesting it had been a site used for the fashioning of new weapon points by one or more native artisans.